I passed by this eatery yesterday and saw that all the seats were occupied so I bought 2 burgers as takeaways for the 4 of us to try at home. 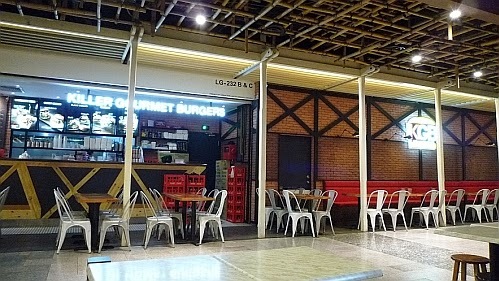 Finally, a gourmet burger joint at a mall near my place. I wanted to try myBurgerLab and Burgertory too but their locations are not convenient for me. 1. KGB Spiked - MYR15.90 - Crust Seared Beef, Sharp Cheddar, Crispy Beef Bacon, KGB Spicy Sauce. I find the crispy beef bacon to be very salty and there is a strong black pepper taste. 2. Truffle'd Swiss Mushroom - MYR20.90 - Grilled Beef, Sauteed Portobello Mushrooms, Swiss Cheese, Truffle Infusion, Herbed Ranch. As expected, there is a very strong mushroom taste which I like. I prefer the taste of this burger to the other one I bought. Prices are nett and they have chicken and vegetarian burgers too. I will be back to try their specialty fries such as Kimchi Fries (with Bulgogi Beef) at MYR13.90 and Texas Jalapeno Steak & Cheese Fries (Beef/Chicken) at MYR14.90 a serving. They highlight that their beef used is 100% steak grade (Australian Grass Fed) on their menu. There are some interesting drinks such as Salted Caramel Pralines Milkshakes and Nutella S'mores (marshmallows) Milkshakes at MYR11.90 each but I don't think I can handle a milkshake with a burger, not even on a sharing basis so maybe one item at a time in the future. Don't be fooled by this photo that was taken when the eatery was not open yet. The seats are usually fully occupied during meal times on weekends and pubic holidays. They look good. Mid Valley, eh? Must KIV this place. Yes. This is at midvalley. Same here, I've always wanted to try the buger lab, but too inconvenient for me to go there.. So we only stick to the burger factory, located in Oasis, if I want to eat burgers that day..
Burger factory. Let me find some reviews about it. I like the mushroom one too! There seems to be many designer burger joints but so far I have not tried any. I actually like burgers a lot so maybe one day I will find one outlet that is convenient to go to. There should be an outlet near your place since there are so many now. A look at the counter is enough to tell me these guys know what they are doing (brightly lit menu with pictures), unlike many of those "I have a dream" joints.. This is their 2nd outlet. Where is this mall Mun? I don't recognize it. TCM? This is the LG level of Gardens/Midvalley Mall. Ahh...this KGB is a new outlet which is the same one next to the dessert place (Eat Me) I blogged about in Bangsar. 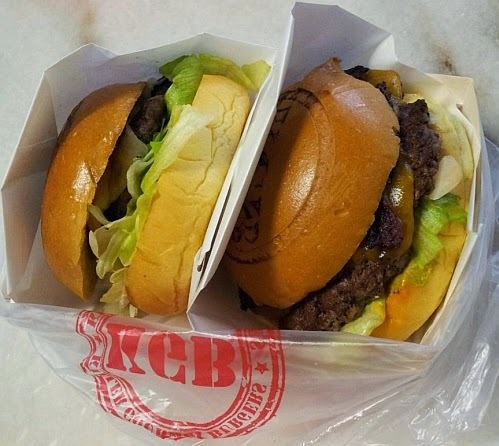 I heard the burgers here are "killers"...kekeke!! I've not had them coz I don't like burgers that much (because of the cheese). You can design your own burger here without putting in any cheese. Hm truffled ah. Got truffle oil taste also? I have not tasted truffle oil before so of the many tastes I detect I don't know which taste is truffle oil. So far have not tried any of these burgers yet! Hope to do so in the new year. I am sure you will find a chance to do so. this is in Mid Valley/The Gardens underground passageway?